I believe that teaching children at a young age about other nationalities and cultures is a key step in decreasing prejudices and with our multicultural world--this is vitally important. Master Communications has created a new DVD series, Worlds Together, has made introducing even remote areas of the world even easier. 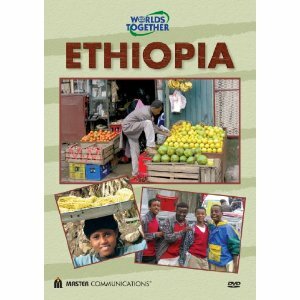 The first three titles from this new line of DVDs takes children and their families to the world's second-largest and second-most-populous continent, Africa, including--East Africa, West Africa and Ethiopia. I was given the chance to view Worlds Together: Ethiopia with my 5 year old son. I found that this DVD was really suited for all ages--the very youngest would enjoy the vivid pictures and sounds, while adults will appreciate the pictures as well as the information they gain from the film. I believe these DVDs would make an excellent addition to school (and public) libraries as well as being a wonderful teaching tool (there is a teacher's guide available for download for each DVD) for teaching children about other cultures and areas of the world, each film lasts only about 25 minutes, so it is perfect for adding to classroom time. Future countries being explored in Worlds Together include: Cuba; Tibet; Ecuador and Colombia. One thing that I have noticed with these films is that they are covering areas where I am finding more and more children are adopted from--so they would make a great asset to those families as well. I think Master Communications has done an excellent job in creating a fun and entertaining way to educate people--young and old--about different areas and cultures, opening them to awareness and understanding and reducing prejudices! Global knowledge is a key to success in today's world. Thank you to Andrea Blain PR for my sample used in this review, opinions are honest. Review by Michelle.